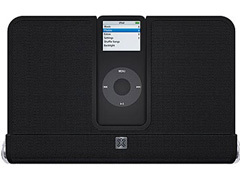 I've always thought that the black iPod nano was one of the best looking music players ever, and XtremeMac's new MicroBlast powered speakers do justice to the nano's stylish design. The black aluminum grill, clear folding cover that ingeniously becomes the base, and tailored protective pouch all perfectly match the nano. 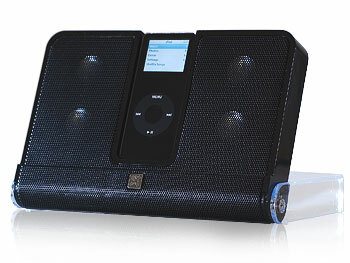 And if you have a white iPod, the MicroBlast includes a matching interchangeable frame. The quad micro speakers are powered by four AA batteries or the included AC adapter. If you use the AC adapter, it also charges the docked nano, even while it plays. I rate the output as above-average for this type of system, especially if you keep the volume setting (on the nano) between 50 and 85 percent. Considering that the MicroBlast is only 1" thick and roughly the dimensions of a standard paperback novel, its big sound surprisingly fills up a small room. I recommend that you play with the nano's EQ setting to customize the output to your ears. Try them all, including the Spoken Word EQ. I also like that you can leave your nano docked, fold close the clear protective cover, and hit the road without worrying about the safety of your iPod. The included slip cover keeps the clear plastic case free of scratches. My only nit with the MicroBlast is that it doesn't include an optional audio-in jack enabling me to use it with my 30 GB iPod video. This would be a great sound unit for watching The Daily Show while sipping my morning coffee. The MicroBlast is designed for the nano, and only the nano. Is the MicroBlast a good value for its $119.95 price tag? I think so. Based on its quality construction, dashing good looks (I really like the aluminum speaker grill), portability, good sound, and choice of power sources, it's a worthy accessory for the handsome iPod nano.